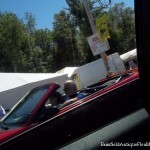 Parking Tips during Brimfield Weeks – There are plenty of parking areas throughout Brimfield. Most do charge a few dollars to park for the day ranging from $5- $10. Be sure to have cash to pay the attendants as most are Ma and Pop operations. Probably the most important thing to remember when parking your vehicle is to determine in advance which show fields are opening on that particular day so that you will be parked nearest to them. Most people like to shop the most recently opened fields since there is always that eternal hope that the treasure they seek will be uncovered as the exhibitors unpack their wares. Don’t be tempted to pull into the first parking lots you spot on the way into town. Your best bet is to take a 5 minute ride through town to get your bearings and select a parking lot once you’ve seen where everything is. It’s a wicked long walk from the big opening dayTuesday fields at the west end of town to the parking lots on the east end, especially if you’re schlepping your purchases. 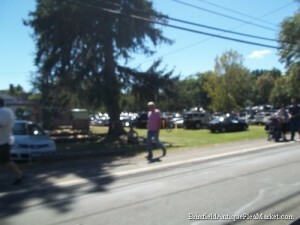 Parking at Brimfield Show Tips – During Brimfield Weeks, there are plenty of parking areas throughout Brimfield. Visitors should consult our show schedule and field map (BSPA Brochure can be printed out from this web site – click here.) in order to help determine where to shop and park. Another consideration is planning your end of day escape route from town. On a busy shopping day, the traffic can be very heavy as so many tired shoppers are leaving town at around the same time. Most generally are eastbound. Those with little patience or on a tight schedule may want to head west out of town on Rte 20 rather than heading east towards Sturbridge as they can then pick up the Mass Pike ( Rte 90) in Palmer and double back towards Boston on the highway. There are also some complicated back roads us locals take to avoid being stuck in the traffic during crunch time. Overall, the traffic situation isn’t so bad if you scoot out a little ahead of the crowd or wait until the rush hour has passed. 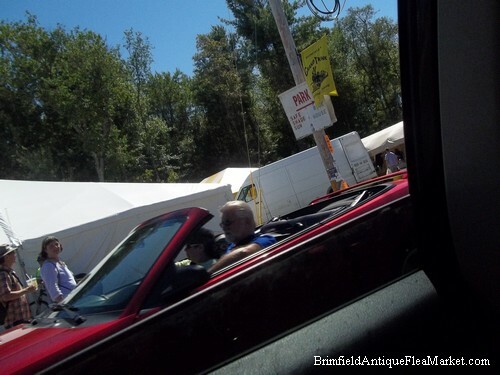 The weekend days, especially Saturday, are often very congested from the Mass Pike exit in Sturbridge heading west towards Brimfield. Come as early as you can to avoid this problem. Hope to see you there! Be sure to bookmark our website and come back soon for more Brimfield Flea Market shopping tips! Happy collecting!